Australia - is it a case of "don't believe the hype?" 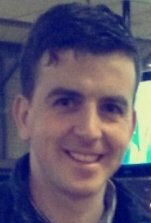 The Racing Post's naps champ Paul Kealy is clearly out to get him and there will be plenty more prepared to oppose a colt who heads to Newmarket as the winner of a maiden and a Leopardstown G3 in which his main rival Free Eagle almost certainly wasn't himself. 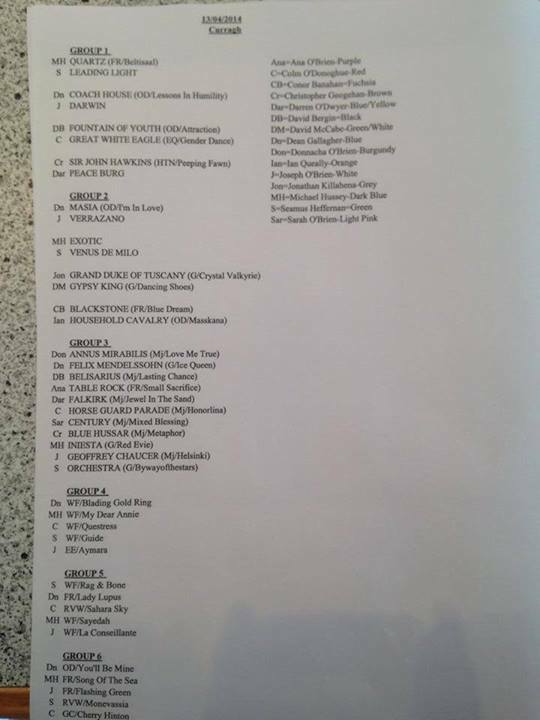 Add in a pedigree which screams middle distances and you can see why people are doubting Aidan O'Brien's suggestion that Australia is a potential superstar, but I'm in no rush to jump to conclusions. Granted, commercial considerations colour a lot of comments about Coolmore colts, but this is a firm with the ability to run something akin to G1 contests on the gallops and reports of what Australia has achieved on Tipperary mornings have been loud and long. "Granted, commercial considerations colour a lot of comments about Coolmore colts, but this is a firm with the ability to run something akin to G1 contests on the gallops and reports of what Australia has achieved on Tipperary mornings have been loud and long." One early spring report suggested he left War Command trailing, while the latest suggests he brushed a very smart sprinter aside without turning a hair during his final serious workout. It all adds up to a tantalising conundrum. 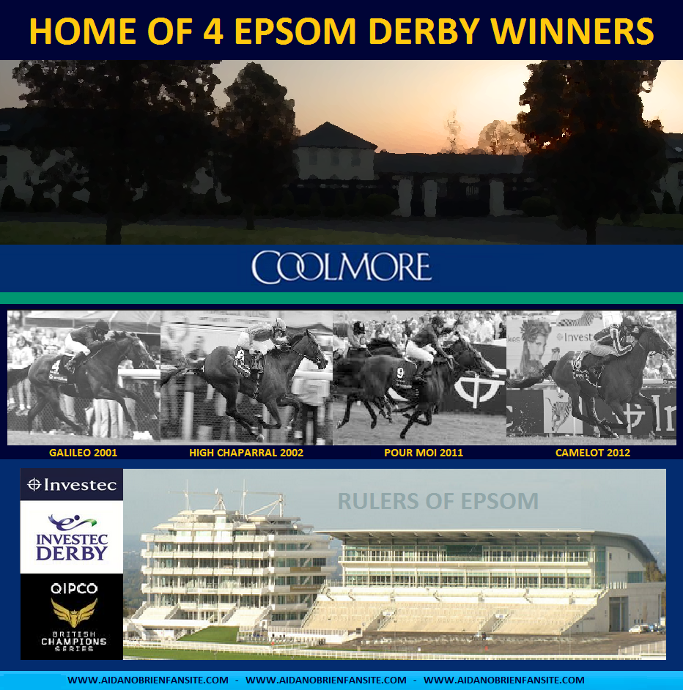 Do you read the form book and the stud book and look elsewhere? 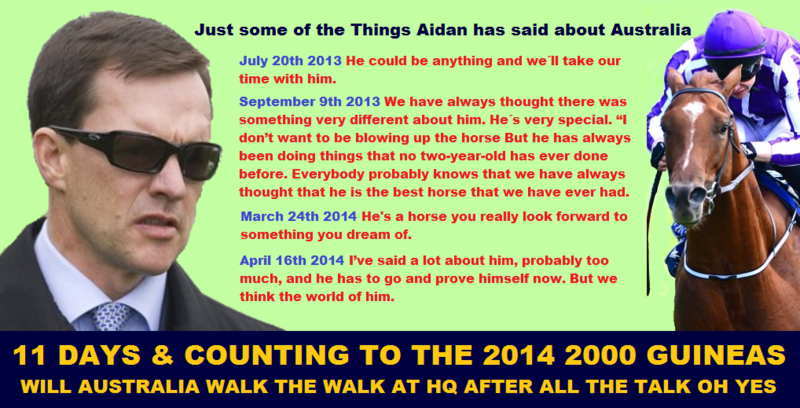 Or do you trust in Aidan and his conviction that this is one of the best prospects Coolmore have ever handled? There is a third way, of course. It involves watching and learning. Australia needs only to go close on Saturday to end the weekend as a very strong Derby favourite indeed. In summary, his abundant potential is one of the key factors in making this one of the most compelling British classics for years. 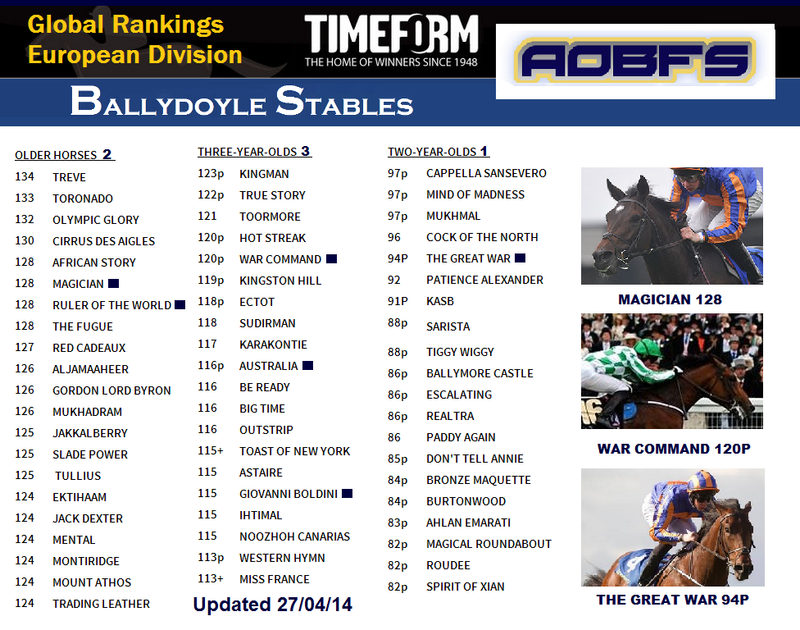 Is War Command the forgotten force of Ballydoyle? Very much so. This colt has been lost in the shuffle as the vibes surrounding stablemate Australia have grown stronger, but his runaway Coventry Stakes win and a decisive Dewhurst success on ground that was probably softer than ideal mark him firmly as among the cream of the 2013 juvenile crop. Reports from various quarters suggest he has been playing second fiddle to Australia on the Ballydoyle gallops this spring, but I dare say something similar was in play when Rock Of Gibraltar and Hawk Wing travelled to Newmarket for the 2002 Guineas. The Rock was sent off at 9-1 with Hawk Wing a raging 6-4 favourite that day but battle hardened professionalism won the day over gallops brilliance in a memorable finish. Time will tell whether War Command can stage a repeat performance, but he's a proven G1 colt and it's a sign of the depth of this year's Guineas that he is still trading at double figure odds even after the announcement that he heads to Newmarket as opposed to Longchamp. Listed Wins & 1 Group 3 Win. Tapestry She has been put in her place twice by Rizeena so the only reason for thinking that she could turn the tables is if this daughter of Galileo has improved significantly over the winter. Her sire's progeny clearly improve well from two to three but her dam, Rumplestiltskin, was a precocious juvenile who ran once at three (unplaced in the 1000 Guineas) and failed to train on. We're guessing a bit as to her well-being but you get the distinct impression that she would be a lot bigger in the market if she were trained by anyone other than O'Brien. Bracelet looks the more interesting of the two Coolmore challengers but it remains to be seen whether her future lies over further. 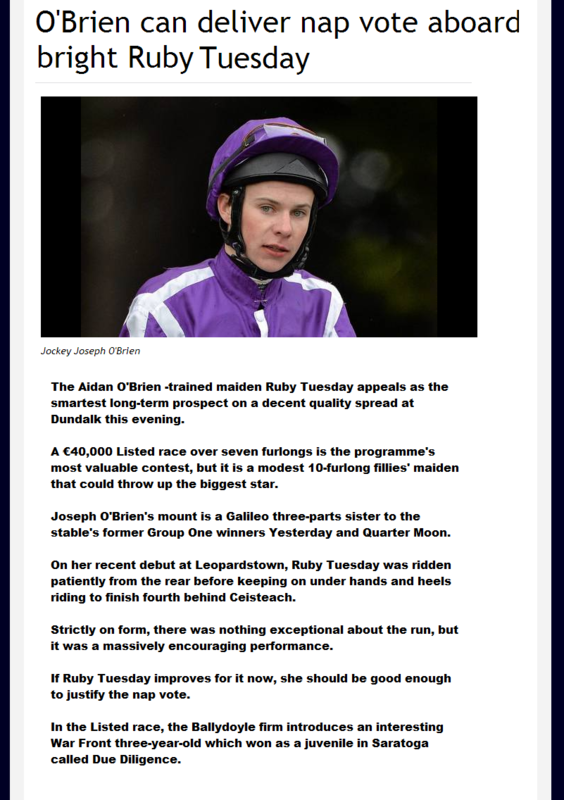 She was deeply impressive on her seasonal debut over seven furlongs at Leopardstown and she was made Oaks favorite on the back of this but O'Brien was quick to point out that he thought she may not stay. If she's given the go-ahead, she would be extremely interesting and I'd certainly keep my eye on the market. If she runs, she's a definite bet at the current prices but you might have to be quick as she's bound to be cut if declared on Friday. Guerre justified favouritism as he took the feature at Naas this evening, the Listed Woodlands Stakes, completing a double on the card for Aidan and Joseph O’Brien. The three-year-old son of War Front was getting weight all around on account of his age, and he was sent to post the 11/4 favourite, after opening at 5/2 on-course (was available at 3/1 last night). Having just his third career start, and his first of the new season, the American bred colt travelled strongly over two furlongs out, and he was soon sent to the front by O’Brien. He was a few lengths clear at the furlong pole, and he kept up the gallop from there, coming home with a length and a half to spare. Maarek, who was sent off a 7/2 chance, got going late in the race and he had to settle for second under Declan McDonogh for Evanna McCutcheon, while Nocturnal Affair (20/1) ran a nice race to take third, a further head behind under Fergal Lynch for David Marnane. Aidan O'Brien said afterwards: "He is fast horse, and that wasn't a bad performance for a three-year-old against older horses. "I'm delighted with that and he could go for the Greenland Stakes (at the Curragh next month). It is also possible that he could go back to five furlongs." The winner, who cost $180,000 US Dollars as a yearling, holds a whole host of big race entries including the King’s Stand Stakes and the Diamond Jubilee Stakes both at Royal Ascot. War Envoy made an impressive start to his racing career with an easy victory in the Irish Stallion Farms European Breeders Fund Maiden at Naas. A son of the in-vogue stallion War Front out of a Listed-winning mare, War Envoy's claims were hardly a secret and he was sent off the 1-3 favourite for trainer Aidan O'Brien. With the O'Brien's son Joseph in the saddle, War Envoy made smooth progress to take up the running around the furlong marker and his rider had to barely flick the whip to send him to the front. Given a considerate ride by O'Brien, the strapping War Envoy won by a comfortable length from Packing Go Go to stake an early claim to be part of the Ballydoyle team at Royal Ascot. Part-owner Derrick Smith was on hand to witness the success, telling the racecourse announcer he was planning to watch Chelsea in their Champions League semi-final second leg against Atletico Madrid at Stamford Bridge on Wednesday. 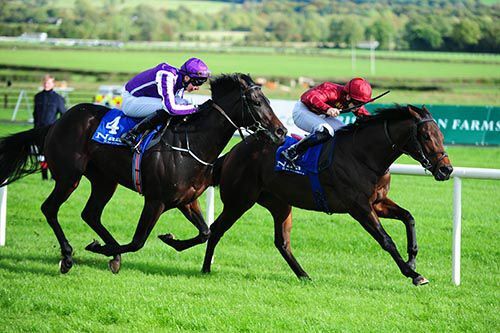 O'Brien snr said: "I'm delighted with that for a first run, you could not ask for much more. He'll come on plenty for that as he is still quite babyish. He will probably come back here for a winners' race." 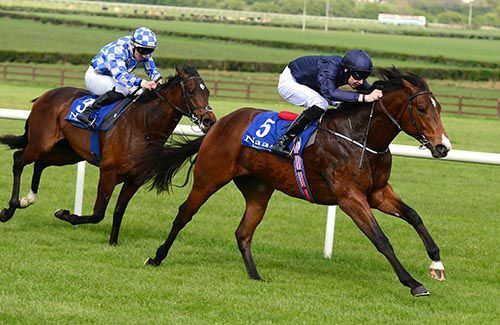 O'Brien sent out another smart-looking War Front colt in The Great War to win at Tipperary last week, and the pair share favouritism with RaceBets at 6-1 for the Coventry Stakes at the Royal meeting. Spokesman Joseph Burke said: "It would appear that Aidan O'Brien is able to unleash talented War Front juveniles at will. Irish-trained horses have won the last three renewals of the Coventry Stakes, with O'Brien training two of those, including last year's winner War Command, another son of War Front." 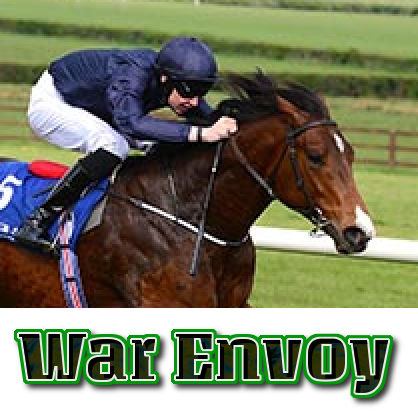 War Envoy justified strong market support throughout the day, as he took the Irish Stallion Farms EBF 2yo Maiden under Joseph O’Brien for his father Aidan. Having opened a 4/7 chance this morning, the son of War Front was backed from 4/9 into clear favouritism at 1/3 on-course. Drawn on the rail in stall one, the bay colt was settled in mid-division before he made smooth progress on the outside with over two furlongs to race. He was pushed to the front a furlong out, and he kept on well from there to score comfortably by a length. Packing Go Go (3/1), who finished second on his debut at Dundalk earlier in the month, had to be content with the runner-up spot yet again, under Gary Carroll forGer Lyons, while Convergence (12/1), also for Lyons, finished a further two and three parts of a length back in third under Colin Keane. Out of La Conseillante who was a Listed winner in France, the winner holds entries in the Group One Phoenix Stakes at the Curragh in August, while he is also entered in the Weatherbys Hamilton Insurance 2yo Stakes at Doncaster in September. Aidan O'Brien said in the aftermath: "I’m delighted with that for a first run, you couldn’t ask for much more. "He’ll come on plenty as he is still quite babyish. He’ll probably come back here for a winners race." AUSTRALIA and War Command will present a formidable barrier to red-hot favourite Kingman in the Qipco 2,000 Guineas on Saturday after record-chasing trainer Aidan 'Brien announced both would take part. 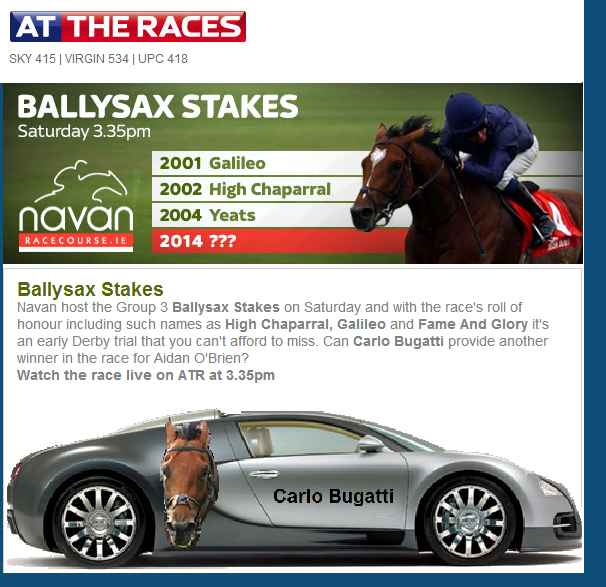 It had been thought that one or the other of the Ballydoyle duo would run in the Newmarket Classic. “We are happy with both Australia and War Command and it looks like both will run on Saturday,” said O'Brien who, with six Guineas wins so far, could equal the record of seven held by John Scott (1842-1862). Australia is William Hill's 3-1 second favourite for the Guineas behind Kingman at evens and with War Command a 12-1 chance. Godolphin will rely on Breeders' Cup Juvenile Turf winnerOutstrip after Be Ready and True Story were absent from a list of 17 five-day declarations. Richard Hannon has three options led by unbeaten Craven Stakes winner Toormore and made up by Night Of Thunder, second to Kingman in the Greenham Stakes, and Free Handicap winner Shifting Power, who also has a 100 per cent record. France could be represented by Bookrunner (Mikel Delzangles) and Charm Spirit (Freddy Head), and Spain by Noozhoh Canarias (Enrique Leon). Miss France (Andre Fabre) and Vorda (Philippe Sogorb) figure among 26 fillies left in the Qipco 1,000 Guineas at Newmarket on Sunday. Half of those are trained in Newmarket including ante-post favourite Rizeena and Euro Charline, the Marco Botti-trained contender who was supplemented on Monday by owners Team Valor. 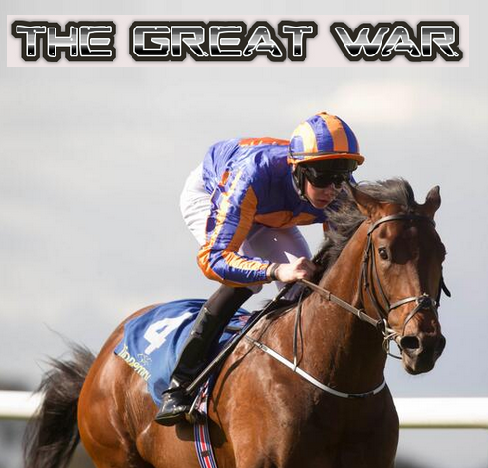 Aidan O'Brien also plans a double assault on the 1,000 Guineas. 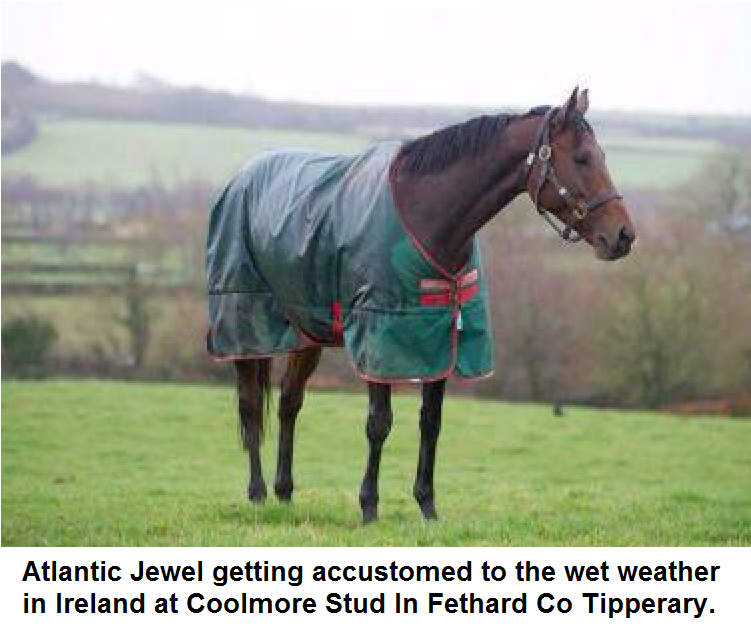 He said on Monday: "At the moment we plan to run bothTapestry and Bracelet." Tapestry suffered the only reverse of her career when third (subsequently promoted to second) to Rizeena at the Curragh last September, while Bracelet was a convincing winner of the Leopardstown 1,000 Guineas Trial. Irish Derby winner Trading Leather could make his debut for Godolphin in the Group 2 Qatar Jockey Club Stakes on Saturday for which 12 were declared on Monday. The son of Galileo and Ouija Board had been winter favourite for the Newmarket Classic but lost that position when John Gosden's unbeaten colt Kingman reappeared with a breath-taking victory in the Greenham Stakes. 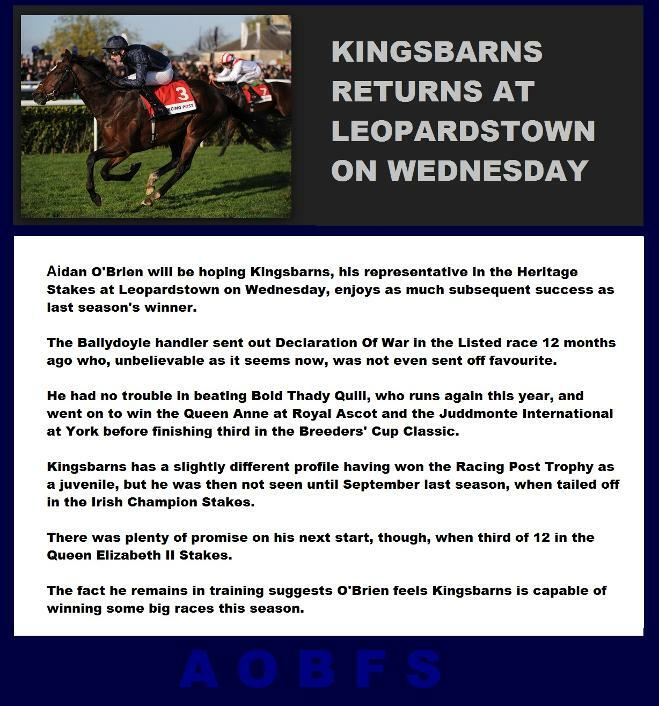 The vibes coming out of Ballydoyle regarding him have been strong for some time, though, and O'Brien can also still call on Dewhurst winner War Command, Giovanni Boldini and Oklahoma City. Richard Hannon is another trainer with multiple chances, in what is his first season holding a licence having taken over from his father. The unbeaten Craven Stakes winner Toormore heads his team, ably supported by Night Of Thunder and Shifting Power. 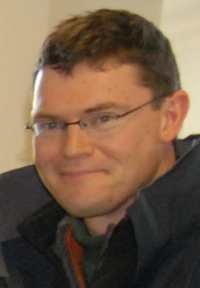 Roger Varian's Racing Post Trophy hero Kingston Hill brings a solid profile to the table, while the William Haggas-trained Ertijaal, victorious on All-Weather Championships Finals Day at Lingfield on Good Friday, is another improver. There is significant overseas interest, too, with Noozhoh Canarias, the first ever Spanish-trained contender, set to take his chance. Freddie Head is bullish about Prix Djebel scorer Charm Spirit, a route taken a few years ago by Makfi, whose trainer Mikel Delzangles could run Bookrunner. Godolphin's Breeders' Cup winner Outstrip, Kevin Ryan's The Grey Gatsby, David Elsworth's Master The World and Marco Botti's Lat Hawill are the other possibles. three-year-old Guerre, who is having his first run of the year for champion trainer Aidan O’Brien. less than Prix de l’Abbaye winner Maarek. Joseph O’Brien completed a treble at Dundalk as he got Egyptian Warrior up close home to win the Dual Racing Sunday 17th August At Dundalk Stadium Handicap. Trained by his father Aidan (completing a quick double) the five-year-old son of Galileo competed in bumpers for the majority of last year, but failed to score in five attempts. He switched to flat rules in September, and scored on his second start at Listowel, before disappointing on his last outing at the Curragh. Having his first start on the all-weather this evening, he was sent off a 7/1 chance, after drifting from his morning price of 9/2. Settled in mid-division the Annemarie O’Brien owned gelding travelled well into the straight, and he was right on the heels of the leaders. 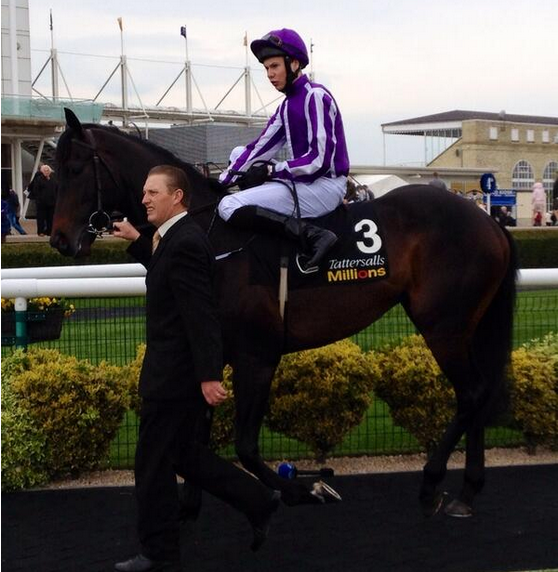 He was niggled along two furlongs out, before O’Brien had to get serious on him with over a furlong left to race. He then gradually reeled in Long Journey Home, getting up near the line to score by half a length. The aforementioned Long Journey Home (14/1) ran a nice race back in second under Wayne Lordan for Daniel O’Sullivan, while Zeftan, who was backed from 8/1 to 9/2 on-course, was a further two and a quarter lengths back in third underMichael Hussey for Peter McCreery. Catchy Lass was sent off the well-backed 6/4 favourite (7/2 last night and from 13/8 on-course), for Anthony Mulholland and Conor King, but she could only manage a disappointing fourth. 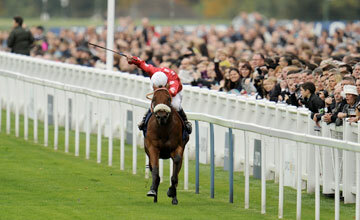 Joseph O’Brien said afterwards: “He is a lovely big horse, but he has been a bit disappointing in a couple of bumpers. "We put the blinkers on him but he probably doesn’t need them anymore as he knuckled down well. I think he will make a decent hurdler on decent ground." 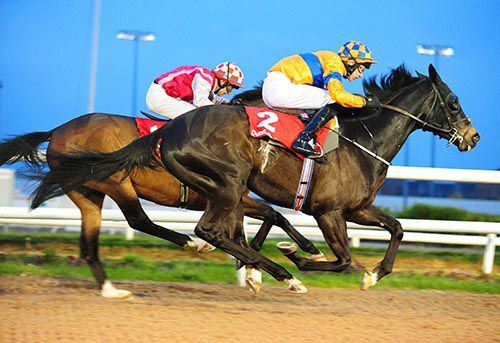 Belisarius finally got off the mark as he took the Louth Land Of Legends Race Day 16th May At Dundalk Stadium Maiden under Joseph O’Brien (double for him) for his father Aidan. A beaten favourite (twice odds-on) on his last three outings, the son of Montjeu again went off the market leader, going to post a 4/7 chance. His four previous outings were over a mile, and stepped up in trip to a mile and a quarter here he made all, stretching clear under two furlongs out before coming home an easy four and a half lengths to the good. Resiliency finished second on his debut under Wayne Lordan for David Wachman, while Captain Teemo was a further two and a quarter lengths back in third underGary Carroll for Ger Lyons at 9/2. Joseph O’Brien said afterwards: "There were no excuses today. He didn’t have to do more than run up to his mark. "He has been running consistently but he has run into a few good horses. He has always worked like a nice horse at home. "I couldn’t say that he won’t get another couple of furlongs and I’m hoping he can go on from this." 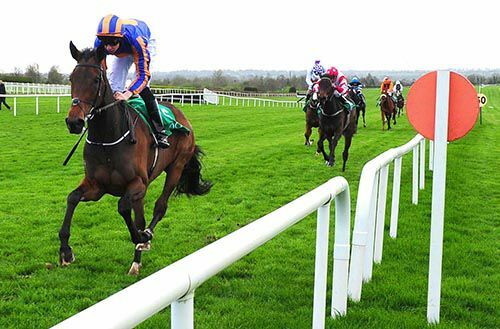 The Great War booked his ticket for Royal Ascot and in the process provided Aidan O’Brien with his first juvenile winner of the season when justifying prohibitive odds with ease in the Irish Stallion Farms EBF Maiden at Tipperary. 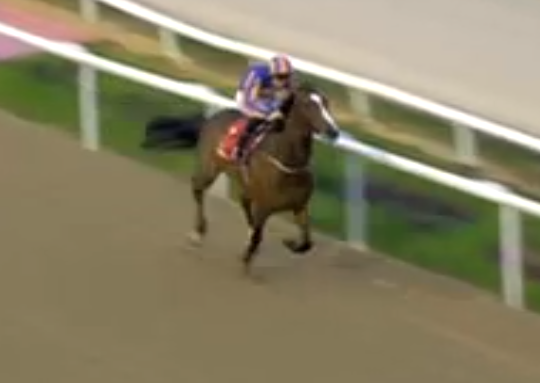 Joseph O’Brien oozed confidence on the million dollar son of War Front, who was supported on track from 2/5 to 30/100. The half-brother to five winners struck the front at the furlong pole, and stretched clear with the minimum of fuss to beat the pace-setting Lupie by two and a half lengths. Sauanna Belle was just a head back in third. Cleveland Street looked a tricky ride on his debut at Dundalk and veered violently right here about two furlongs out with Pat Smullen eventually pulling him up and dismounting. 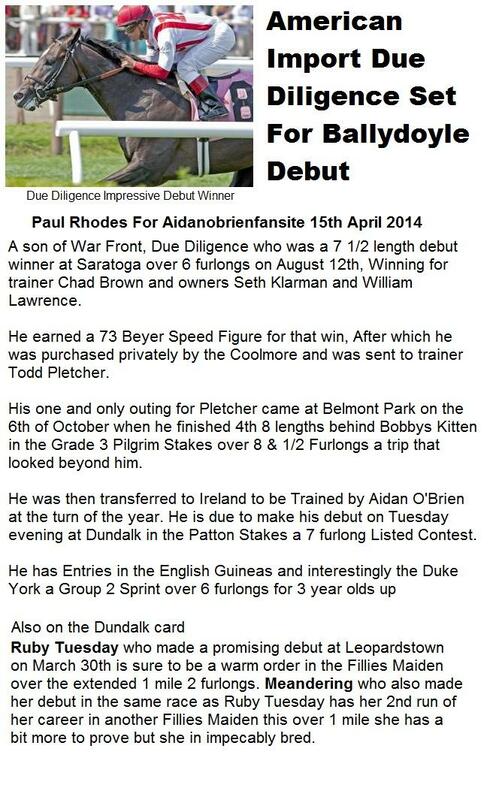 Aidan O’Brien said, “He’s a fine horse and I’m delighted with him. He’s a fast horse with lots of speed. 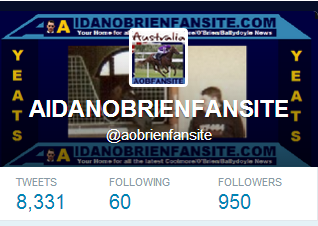 Tapestry & Bracelet are the only 2 Adan O'Brien Trained Fillies reaming in the Qipco 1000 Guineas. 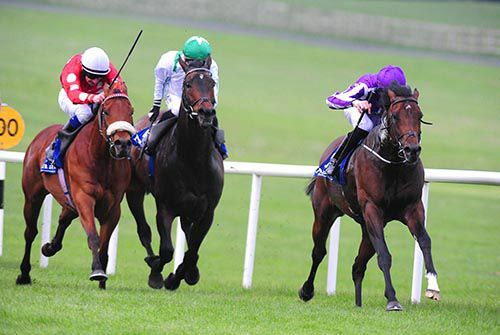 Tapestry Who as a Juvenile Won the Group 2 Debutante Stakes at The Curragh on August 11th. She has not seen a Racetrack Since her unlucky Defeat in the Group 1 Morglare Stud Stakes in September. She will go straight to Newmarket without a prep run she looked a Juvenile with big Potential and appears to be Ballydoyle's Number 1 Filly this season and is bound to be a big player in the Guineas and Oaks. 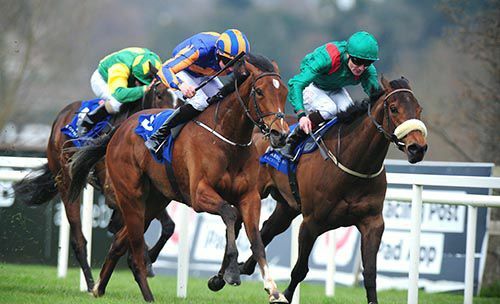 Bracelet Was an impressive winner of the Group 3 Irish 1000 Guineas trial on the 30th of March at Leopardstown. She looked a very smart filly who you'd imagine will flourish for a step up to a Mile at Newmarket. Aidan had other options but has gone with Tapestry & Bracelet and to me they look to have the Potential to take the 1st Fillies Classic of the season i always thought alot of Tapestry. She won the Leopardstown 1,000 Guineas trial quite nicely on her reappearance and the plan is to send her for the Qipco 1,000 Guineas. She came out of the race well and will appreciate better ground than she had at Leopardstown. Hopefully, she’ll make into an Oaks filly, although Joseph Isn’t sure she’ll get 1m4f. That doubt might not be a bad thing. She won the Group 2 Debutante Stakes and was unlucky when she went back to the Curragh for the Group 1 Moyglare Stud Stakes in which she was promoted to second after a stewards’ inquiry. She’s done well since last season and came to hand quite early. We backed off her for a while but she’s been going well and will be ready for the 1,000 Guineas. She goes straight to Newmarket and we think she’ll go on and stay further than a mile. My Thoughts & Opinion on Australia. As Visitors to the site would know i put a horses to follow list up every season and this year is our 3rd edition of the horses to follow list. When putting together a horses to follow list in early March you go on Pedigree as there is very little information word whispers that early on a 2 year old i base my picks on research of pedigree how parents performed on the track and in the breeding shed also What there price tag was at the sales (if applicable) is also taken into account. When it came to picking last years team for the list AUSTRALIA literally picked himself for the reason i am about to list. 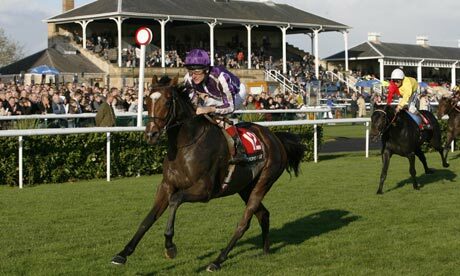 His Father Galileo the ultimate sire and undoubtedly in time he will break all known records. Galileo's Yearly conveyor belt of multiple Group one winners kept on rolling again in 2013 with the latest version Magician showing his Class & brilliance by landing a Breeders Cup Turf. 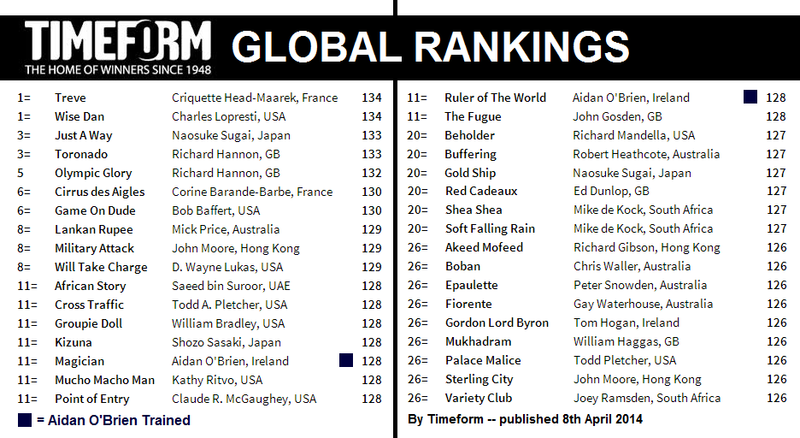 Added to that Galileo has already produced the greatest thoroughbred racehorse I have ever seen Galileo's Roll of Honor Boasts no less then 38 individual Group One Winners and 16 Multiple Group One Winners. His Award Winning Mother Ouija Board was an 8 time Group One Winner & undoubtedly A Racecourse Champion She was a Dual Classic winner & a 2 time Breeders Cup Winner. So me picking Australia was Hardly rocket science. So what has Australia actually achieved on the track thus far not a whole lot compared to former Ballydoyle horses that at the time were touted as potential superstars such as High Chaparral, Rock Of Gibraltar, St Nicholas Abbey Camelot & Kingsbarns who all ended there Juvenile Careers as group one winners BUT when you delve into the history books you will see that His father only raced once as a 2 year old and was merely a maiden winner going into his 3 year old career. 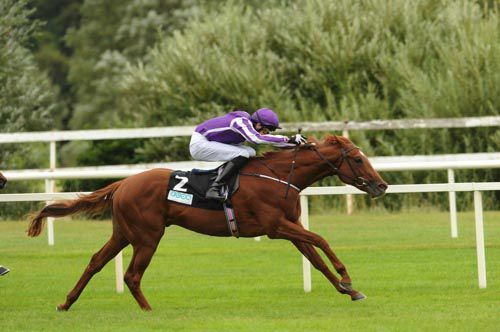 We saw Australia make his debut on the 30th of June 2013 at The Curragh he missed the break and gifted a lead to his rivals he flashed home late showing a turn of foot but only beaten by a neck By Renascence Art. He returned to the Curragh 3 weeks later where he beat Carla Bianca by 3/4 of a length, subsequently Carla BIanca went on to finish 4th in the Group One Morglare Stud behind Rizeena. Australia was then given a 6 week break and reappeared on the 7th of September at Leopardtown in the Group 3 Breeders Cup Juvenile trial over 7 furlongs for his final outing as a 2 year old and wow this is when we really saw the potential He made his run approaching the furlong marker and swept past the highly regarded Free Eagle in a matter of strides. He looked a great mover very athletic He Looked the part, Undoubtedly he was very very unlucky not to have finished his 2 year old campaign unbeaten. After the race His Trainer Aidan O'Brien heaped huge praise on his star in the making and said He could possibly be my best ever very high praise indeed. Australia Reappeared last Sunday at The Curragh for an after racing gallop where he looked a Million Dollars he looks ready to roll now clearly he has grown into his frame and wintered well he traveled well with his stable mates in Aidan's 1st Group of horses to hit the track on Sunday he was asked very little & at this stage you wouldn't expect him to be. In the week leading to the public racecourse gallop Australia received huge market support in the Guineas his price shortened with every passing day. On Sunday Trainer Aidan O'Brien dropped the bombshell that Coventry & Dewhurst stakes winner will only run in the Guineas if god forbid something happens to Australia not a bad Plan B eh. In Summary i think taking War Command out of the Guineas speaks Volumes for what the lads think about Australia its showing huge belief in the horses ability to get the job done at HQ its a huge boost to the confidence that has already been shown in him i take the defection of War Command as a huge positive in Australia's favor Aidan/Coolmore love winning the English Classics and no doubt as shown in the past they like to cover all there bases every base & Usually throw everything at winning them, they clearly think they have ALL bases covered this time with the one horse AUSTRALIA. Added to the fact that his Trainer on Sunday once again stated Australia was the greatest flat horse he has ever trained leaving himself open for huge criticism by the media if it all goes wrong almost piling the pressure on himself and his brilliant team i don't think he would do that lightly Don't forget the comment also puts huge pressure on his own son who will pilot the potential star in the Guineas and Derby and all going well the St Leger for a triple crown attempt I Think Aidan genuinely believes he has the best flat horse he has ever had yes part of his job is being a salesman for future Sires i just get the feeling that this time that is not the case he looks like a kid at Christmas and is very excited by what he has & what he sees everyday at home clearly something very very special. 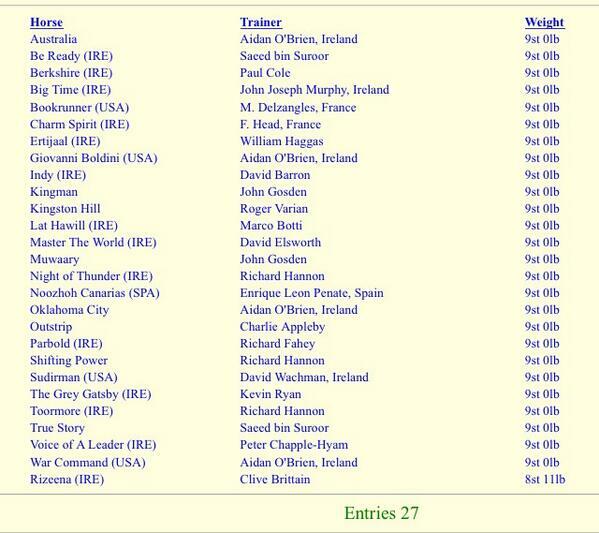 27 remain in the Qipco 2000 Guineas including Australia, Giovanni Boldini, Oklahoma City, & War Command. 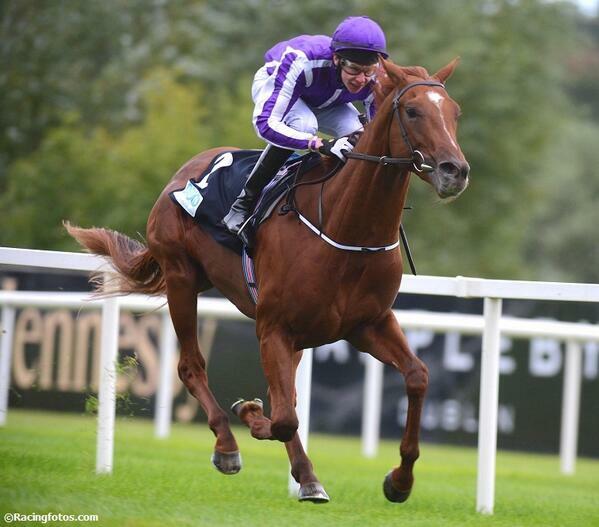 Aidan O'Brien is pleased with Australia ahead of the colt's intended seasonal debut on Saturday week. Australia is currently second favourite for the Quipco 2000 Guineas and heads the ante-post market for the Investec Derby. 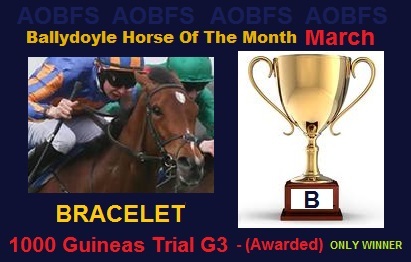 The son of Galileo, out of the brilliant mare Ouija Board, has always been held in very high regard at Ballydoyle. He looked an exciting prospect when ending his two-year-old campaign with a six-length romp over Free Eagle in the Group Three ICON Breeders' Cup Juvenile Turf Trial Stakes at Leopardstown on September. "We're happy with him and always have been. 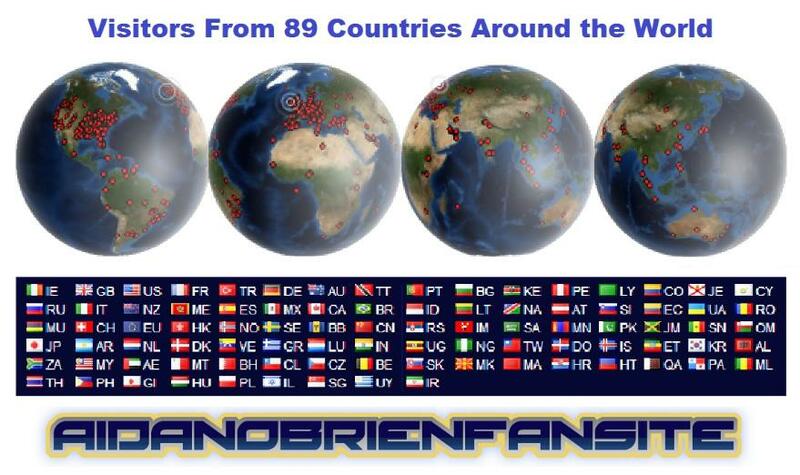 He's never done anything other than that for us," O'Brien told At The Races. Australia could be accompanied in the Classic by his stablemate War Command, who wound up his juvenile season with victory in the Group One Dewhurst Stakes at Newmarket in October. "The plan was always to train both for it and then we'd see closer to the time," said O'Brien. "It's very possible both will run, but the boys (owners) will decide that closer to the time." 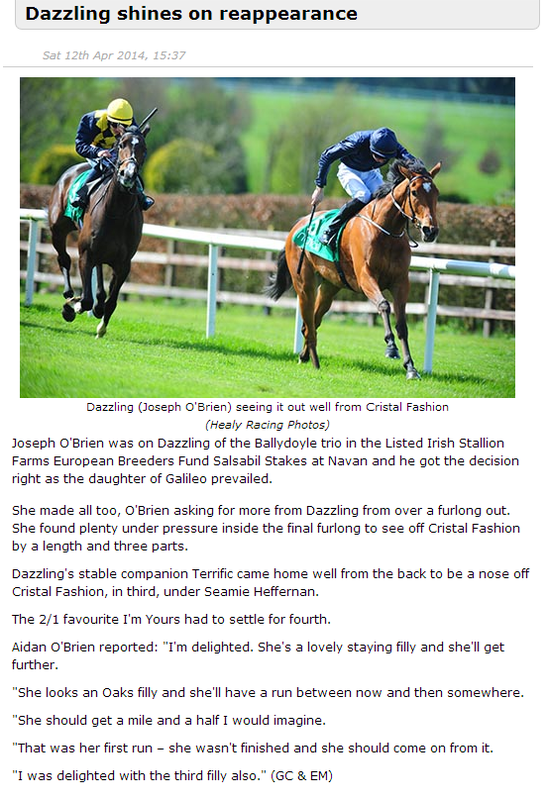 The Ballydoyle team have suffered a number of reverses in the past week but The Islander gave Aidan and Joseph O’Brien a boost when taking the concluding Best Dressed Lady & Gent Maiden in convincing fashion at Cork. The 5/2 favourite was prominent throughout, taking over two furlongs out from the front-running Bush Pilot and soon asserted. The Fastnet Rock colt was in control in the final furlong and came home two lengths clear of Dark Alliance, with supposing another three quarters of a length away in third. 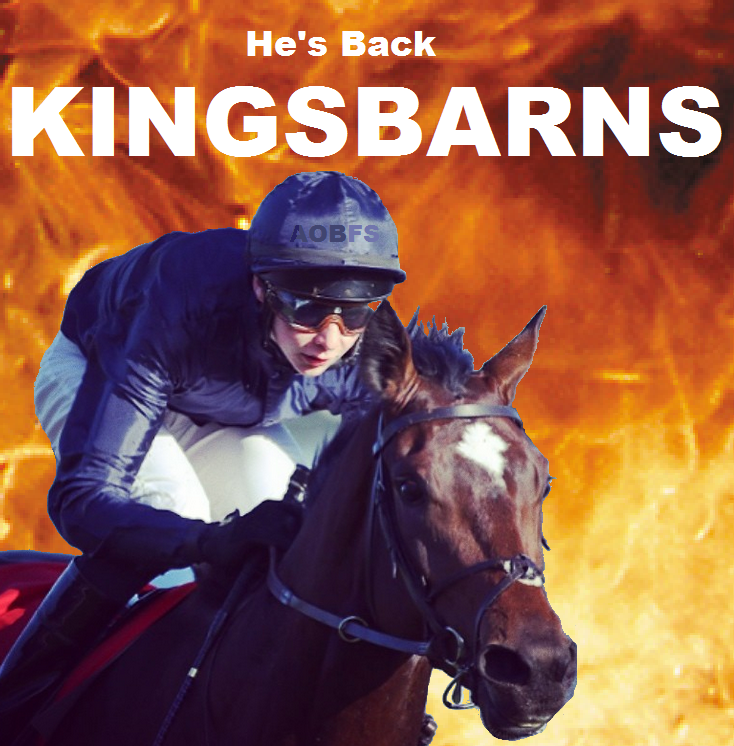 Joseph O’Brien said, “He’s a lovely horse but it just took a few runs for the penny to drop. The faster ground is a big help for him and he should get a mile. decent debut he definitely has potential and there is alot more to come. Former Ballydoyle inmate THE OFFER (Gai Waterhouse/Tommy Berry) started as the favourite in the Group 1 Sydney Cup run over 3200m and he showed why he was solid in betting all week with an impressive turn of foot in the straight to streak away from the rest of the field. Ridden by Tommy Berry he sat midfield and when they straightened up he made his run around the field and hit the lead at the 150m mark and never looked like he would be beaten. Opinion ran second with Sertorius in third. "What a stayer!" What a stayer!" exclaimed an excited Gai Waterhouse. "Look out Melbourne Cup 2014! Jockey Tommy Berry "I got into a nice spot early and I bided my time when a few got going early because I know how good a turn of foot he has and he did it again. 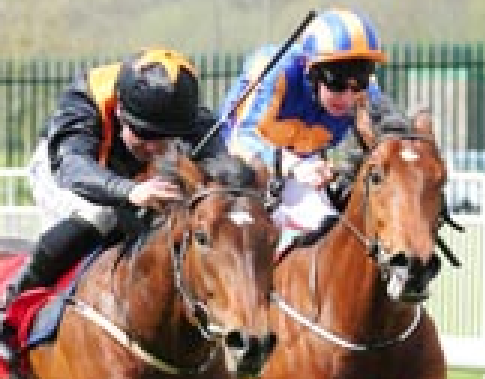 The Offer's Career Highlight whilst at Ballydoyle was a 3rd place in the 2012 Curragh Cup G3 he was unraced as a 2yo. 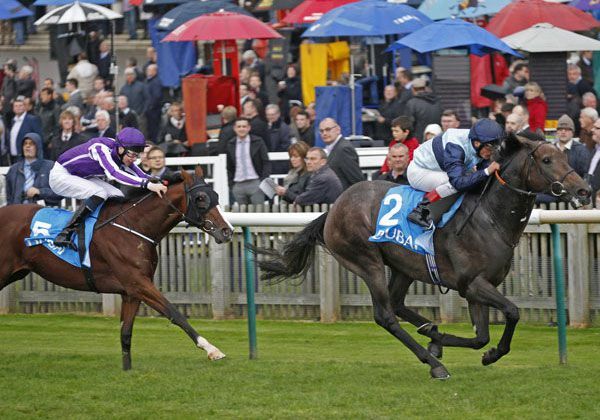 Ballydoyle's Johann Strauss was sent off a well-backed favourite for the £200,000 Tattersalls Millions Three-Year-Old Trophy at Newmarket yesterday, but he failed to dispel his growing reputation as a bit of an enigma. He eventually finished a never-dangerous sixth under Joseph O'Brien as the New Approach colt Sudden Wonder (7/1) just prevailed from Observational to complete a quick Godolphin double under Mickael Barzalona. Just 24 hours after the HIGH CHAPARRAL colt had set a new European Record for a breeze up, the high water mark was moved again when the WAR FRONT colt from Willie Browne’s Mocklershill was sold for 1,150,000 guineas. 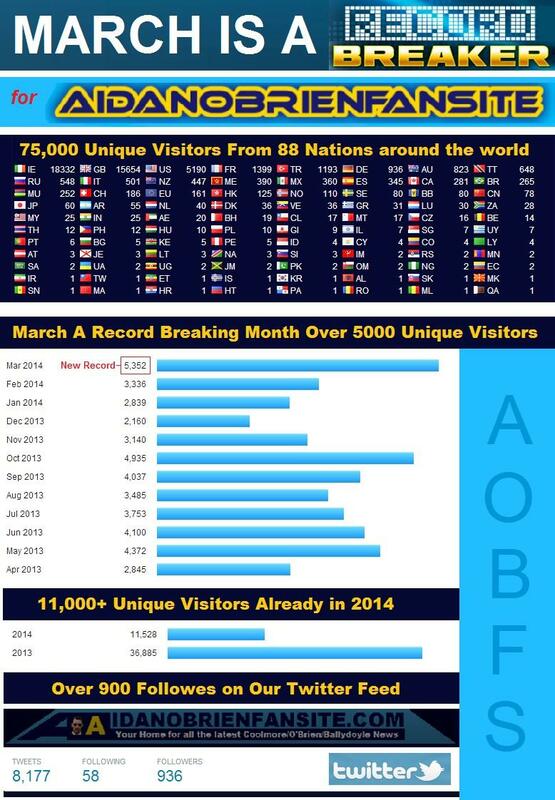 As well as a new European record, the sale is also the top price anywhere in the world this year. 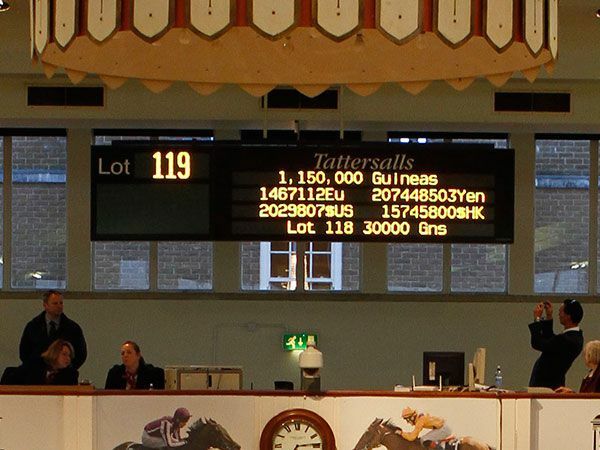 Trade on the second day saw a total of 47 lots sold for 5,086,000 guineas, at an average of 108,213 guineas and a median of 62,000 guineas. 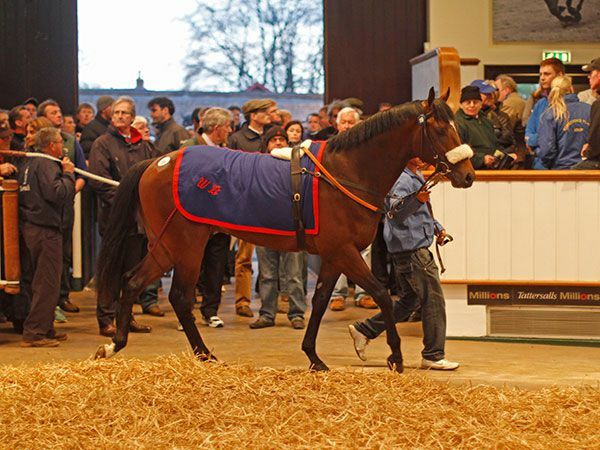 This took the two day sale total to 93 lots sold for 10,489,000 guineas, at an average of 112,785 guineas and a median of 70,000 guineas. The turnover was up 14% on 2013, with the average and median rising 26% and 27% respectively. Catalogued as Lot 119, the colt by WAR FRONT out of the DIXIE UNION mare JULIE FROM DIXIE, attracted a plethora of bidders including Seamus Burns and Charlie Gordon-Watson before David Redvers took up the running along with Jamie McCalmont. Darley’s John Ferguson then joined the fray and looked to have secured the colt before McCalmont made the successful bid, stood alongside Michael Tabor, MV Magnier and Paul Shanahan. "It is brilliant, I can't believe it," said consignor Willie Browne. "I knew he was popular, he did a great breeze, he ticked all the right boxes and all the ingredients were there for a big price. And, of course, he is by the right stallion. It just shows you if you have two people on a horse, what you can get. "He was led out in the US unsold at $240,000 as a yearling and I'd thought I go and get him privately for $200,000 - in the end had to pay $250,000! But he was worth it." Aidan O'Brien feels Johann Strauss' luck can turn for the better in the £200,000 Tattersalls Millions 3-Y-O Trophy at Newmarket on Thursday. The son of High Chaparral goes into this race as one of the best maidens around, but he has every chance judged on his second place behind Kingston Hill in the Racing Post Trophy at Doncaster on his final start as a juvenile. He looked most unfortunate on his reappearance at Leopardstown just two weeks ago, when he struggled to get a clear run and had to settle for third spot behind Fiscal Focus over a mile. 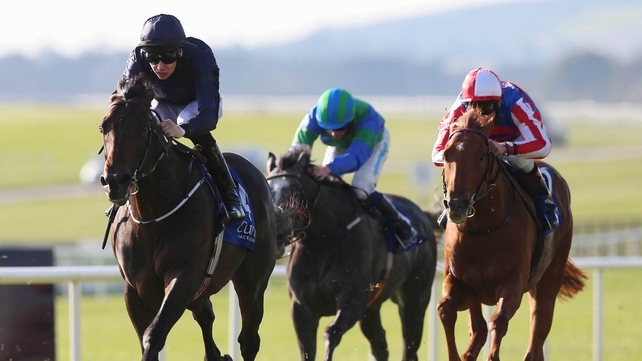 "Johann Strauss gained some valuable experience last year and finished off with a storming run in the Racing Post Trophy," said the Ballydoyle trainer. "He was unlucky on his first run back this season but still showed plenty of promise. "He seems to have come out of it in good form so we're hoping he'll run well again." A total of 16 horses have been declared for the £200,000 Tattersalls Millions 3-Y-O Trophy over 1 mile 2 furlongs at Newmarket’s Rowley Mile Racecourse on Thursday 17 April, including JOHANN STRAUSS, who was second behind KINGSTON HILL in last year’s Racing Post Trophy and is currently as short as 33/1 for the 2,000 Guineas and 20/1 for the Investec Derby. Unbeaten colt Geoffrey Chaucer could be prepared for a tilt at next month's French 2000 Guineas after starring in a team of over 40 horses worked by Aidan O'Brien after racing at the Curragh on Sunday. The three-year-old son of Montjeu won a Leopardstown maiden and the Beresford Stakes at the Curragh as a juvenile and the master of Ballydoyle is considering whether to let his charge return in the Poule d'Essai des Poulains at Longchamp on May 11 or run him at Leopardstown on the same day. 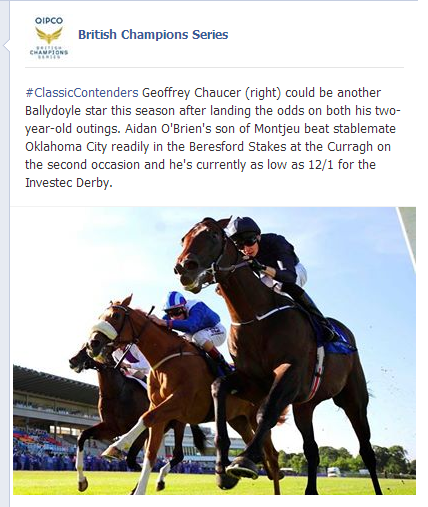 "Geoffrey Chaucer is very much in the picture for the French Guineas. 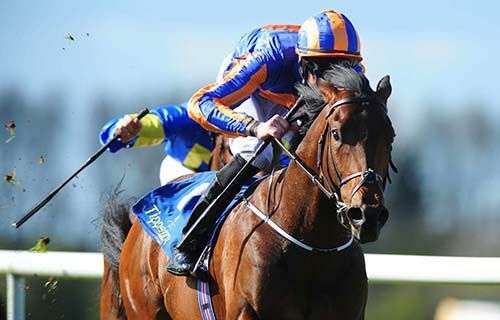 He's showing a lot of speed for a Montjeu," said O'Brien. "I was thinking of running him at Navan on Saturday, but I was happier to come away here and he'll either start off in the Derrinstown Stud Derby Trial or the French Guineas on the same day." Ascot Gold Cup hope Leading Light also featured and is due to kick off his season in the Vintage Crop Stakes at Navan, while American import Verrazano also delighted his trainer ahead of a likely trip to Berkshire in June. O'Brien said: "The plan is still to start Leading Light off in the Vintage Crop at Navan, then it will be the Saval Beg Stakes at Leopardstown and the Ascot Gold Cup. "I was very happy with Verrazano today. His target is the mile race at Ascot (Queen Anne Stakes) and he'd only run before that if the ground was good." In all O'Brien put 27 three-year-olds and older horses through their paces, while 15 two-year-olds were divided into three groups. "Great White Eagle went nicely and the plan is to come here for the Tetrarch Stakes," said the trainer. "Venus De Milo was good, but I'm not rushing her. She's a lovely big filly. "Felix Mendelssohn (unraced three-year-old) is a nice horse and I was very happy with the two-year-olds. A number of them will be ready to run soon." 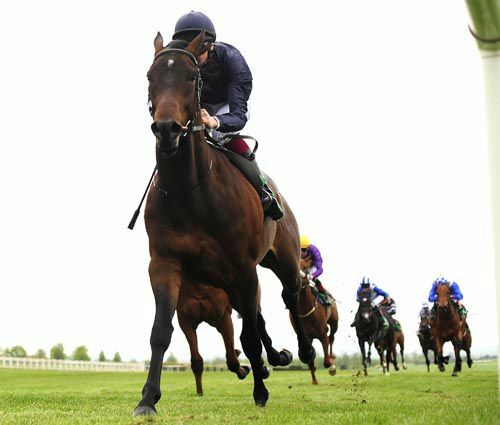 The much-vaunted Australia was not part of the team working at the track, but O'Brien confirmed both he and stable companion War Command are on target to line up in the Qipco 2000 Guineas at Newmarket on 3 May. The trainer did concede he was impressed by the explosive performance of John Gosden's Classic contender Kingman in Saturday's Greenham Stakes at Newbury. O'Brien said: "John always had a very high opinion of him, even as a two-year-old, and you'd have to be impressed with him. "He travelled very well and quickened very well. 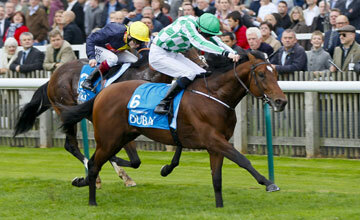 "Australia and War Command are fine and we training them for the Guineas at Newmarket. "Everyone's horse has to get there and it's three weeks away. "With horses you take it day by day, but the Guineas looks like it's going to shape up into a proper race. "Hopefully we get there and hopefully we'll all look forward to it. Gorteo (9/4 into 6/4) tried to put it up to odds-on favorite Palace from the front in the #20 Family Ticket For May 18th Family Day Fillies Maiden but she was ultimately easily brushed aside by the 'jolly' in Navan's finale. Bringing up a double for Ballydoyle after Dazzling's win earlier and indeed also a brace for the stallion Fastnet Rock (on the mark with Fascinating Rock in the 3.35) Palace got a patient ride as she did on debut at Leopardstown 10 days ago. Joseph always looked confident that she'd pick up when required in the straight and she eventually stretched away impressively inside the last for a four and three parts of a length victory. Also bred by the Ballydoyle maestro under the Whisperview Trading banner, APOB remarked: "She's a nice filly and I'm delighted with her. We'll have to see whether she runs again now before the Irish Guineas. "She's coming forward lovely. She's very smart and we always thought she was. "The Fastnet Rocks want really good ground. It's Australian breeding and they want fast ground. They have big engines. "She was our best filly last year but she met with a setback and didn't get to run." $300,000 Purse well to continue his run of good form on Saturday. Tommy Berry sent a kiss skywards to his brother Nathan as he crossed the line on The Offer at Randwick, dedicating the win to his late twin and riding companion. The Offer reaffirmed his favouritism for the Sydney Cup after taking Saturday's Group Two Chairman's Handicap (2600m). It was an emotional return to scale for Tommy as he acknowledged the applause of the crowd for his riding skills and strength of character over the past few weeks. His last win before Saturday was on The Offer two weeks ago when he made a flying trip from his brother's Singapore hospital bedside when it appeared Nathan was making progress. But the 23-year-old died last Thursday week from the rare epilepsy-related illness NORSE syndrome after being brought home to Sydney. "That was Nathan's win today," Berry said. "It's been the hardest week of my life for sure, but no harder than it's been for Nathan. "Coming here today and riding a winner for him, that's very special. "It's something that I love doing. It's something that Nathan loved doing. "This is my job. This was Nathan's job." He said he had been overwhelmed by the support for him and his family in the week he buried his brother at a public service. "The support of everyone has been amazing. We'll never be able to thank them enough and never be able to repay what they've done," Berry said. "It just shows what a special man my brother was." He and trainer Gai Waterhouse both think The Offer is pretty special as well. "Just back him in the Sydney Cup. He'll bolt in," Waterhouse said. Berry made his move on the $2.50 favourite coming to the home turn. As he did two weeks ago in the Manion Cup, The Offer increased his stride on the heavy surface and went to the line 2-1/4 lengths ahead of Tremec ($17) with Hippopus ($8.50) another neck third. The Offer is at $3.50 to win the Group One Sydney Cup (3200m) next Saturday. Joseph O'Brien gave El Salvador a canny ride as the chestnut repeated last year's success in the concluding Summer Twilight Nights Race at Limerick. 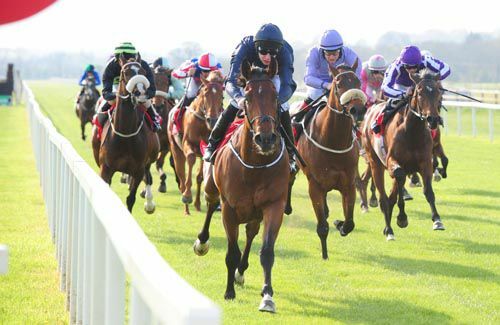 Leading his two rivals, O'Brien steadied things right down after about four furlongs when Seamie Heffernan elected to go on aboard 4/9 shot Missunited. 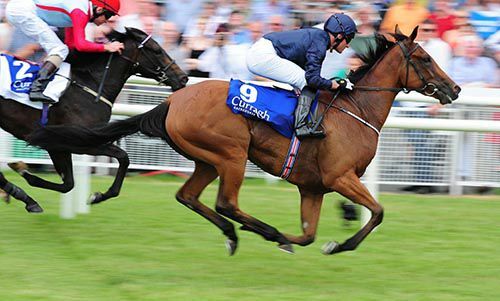 O'Brien attacked again to lead in the final two furlongs and Missunited couldn't quicken. It was left to outsider of the trio, Cosmic Cannonball, fresh from a maiden win just last Saturday, to try her case then but she was a length and a half down on El Salvador at the line. They left the aforementioned 'hotpot' four and a quarter lengths behind. O'Brien, riding El Salvador for his mother and father, Annmarie and Aidan, said: "He's a lovely big horse. He disappointed a bit last season but he seems to have come to himself again. "He's a nice staying type and as he's won twice at Dundalk too I don't think ground is an issue for him." Cristoforo Colombo and Afonso De Sousa are two Aidan O'Brien entries in the Big Bad Bob Gladness Stakes at the Curragh on Sunday. The high-class Cristoforo Colombo was last seen finishing a creditable sixth to the brilliant Wise Dan in the Breeders' Cup Mile at Santa Anita in November. Afonso De Sousa has not had the same level of success as his stablemate but generally campaigns at a good level, although he would need to bounce back from a disappointing effort in the Irish Lincolnshire on his seasonal reappearance. Custom Cut was successful in the Group Three event 12 months ago when with George Kent, but has since been sold and is now at David O'Meara's base in North Yorkshire and could bid for a repeat after a promising first run for his new trainer in a Listed event at Doncaster recently. Paul Deegan's lightly-raced Sruthan promises to be a contender for some good prizes this season, having rounded off his three-year-old season with victory in the Group Three Concorde Stakes at Tipperary. Charles O'Brien is double-handed with the fillies Lottie Dod and Pop Art, while Tommy Stack can call on Park Express Stakes sixth Wannabe Better. 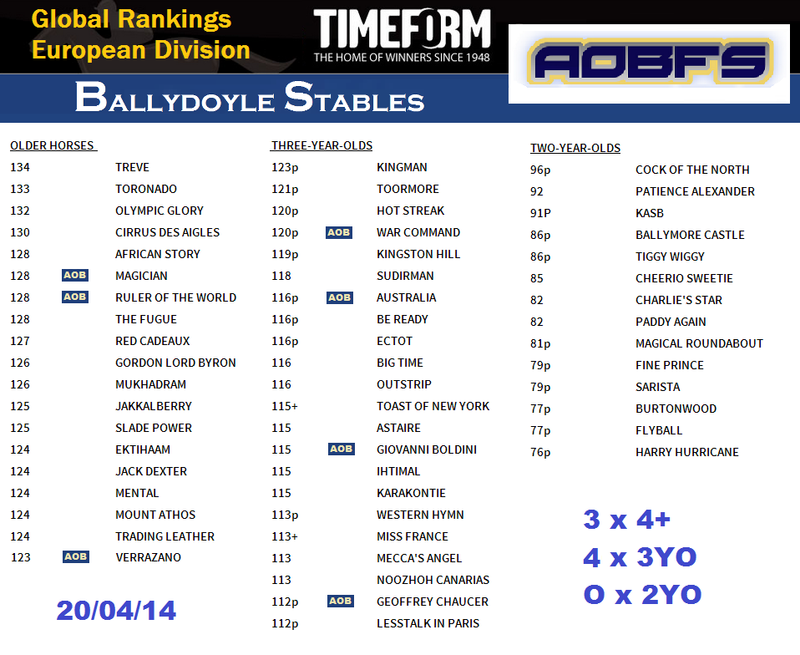 Bold Thady Quill (Ken Condon), Bubbly Bellini (Ado McGuinness) and Tobann (Jim Bolger) complete the possibles. Ruler Of The World is among 28 entries for the Investec Coronation Cup (In Commemoration Of St Nicholas Abbey) at Epsom on June 7.
and the trainer will no doubt be keen to keep the prize. 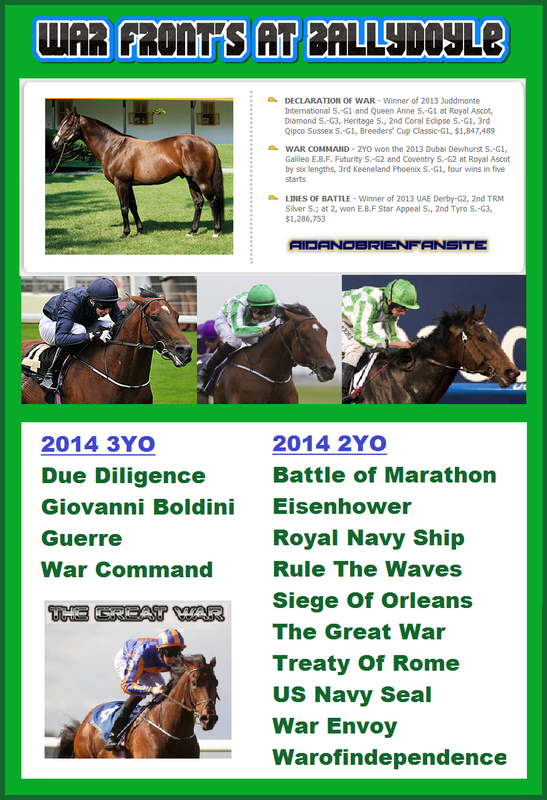 2YO page updated 2 more named today.